Welcome in your Oltrarno hotel, in the most stunning district of Florence! Discover the “Rive Gauche” of the Arno River, the “coolest district in the world” according to Lonely Planet, home of historic craftsmanship tradition, an elegant and prestigious area by the Renaissance onwards, with the purchase of Palazzo Pitti by the family of the Grand Duke Cosimo I. Our boutique hotel enjoys the most strategic location to unveil the secret beauty of this authentic and absolutely “Florentine” neighborhood, just open the door and follow us in a fascinating tour! Our Oltrarno hotel, the heart of the best district in Florence! During the Middle Ages, as you can deduce from the names of some streets, Oltrarno was the district of goldsmiths, wool artisans, peasants, workers of religious sites, like the famous "ciompi" who rebelled in 1378 for the hard conditions of life to which they were subjected. “Diladdarno” as the Florentines call the Oltrarno zone, still host several workshops keeping alive the original vocation of the place, you will surely fall in love with these marvelous places! If you wish Eleonora, the owner of our Oltrarno hotel, and Roberta will recommend you the finest boutiques, meeting all your expectations and needs. On this page we can only write a short preview of the magnificent world you could discover… Are you ready for the Oltrarno district in Florence? Let’s start exploring an exotic corner. Takafumi Mochizuki is a wood inlayer, known by the Tuscans as the "Zouganista" ("Zougan" in Japanese means “to inlay"), an artist able to carry on the traditional Florentine art of restoration accompanying it with the personal touch. Moleria Locchi is the ancient workshop where the art of glass blowing is still practiced today, in activity since the late nineteenth century. Also the engraving is manual. You can visit the shop whenever you wish. All the antiques atelier in via Maggio definitely are worth a visit (Pratesi, Bartolozzi are just a few), obviously including our Botticelli Gallery, while if you want to enjoy an intimate evocating glimpse, usually not so frequented by the mass tourism, go to Piazza della Passera, in direction of Ponte Vecchio. "Piazza" is undoubtedly an exaggeration for this small and welcoming opening between the narrow streets behind Via Maggio. Stroll along the splendid Via Toscanella: here once was the studio of the painter Ottone Rosai, may be the best artist ever in describing the atmosphere that characterizes certain Florentine views. 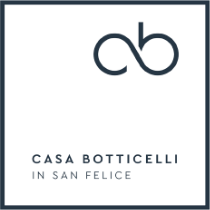 Casa Botticelli, the art of hospitality, a gallery of emotions in the Oltrarno district.